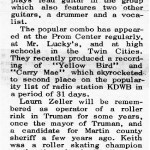 1955- 1958: Bud Zeller and his family are living in Truman, Minnesota (near Mankato). Bud owns and operates Zeller Roller Rink and his son, Keith is at the rink seven days a week to hone his skating skills and becomes an award winning roller skater. Bud plays records over the PA system at the rink while the kids skate and starts to play rock’n’roll music along with the “old time” music. Skaters bring in the latest 45’s they have purchased so they can hear the songs played at a loud volume over the PA system while they skate. 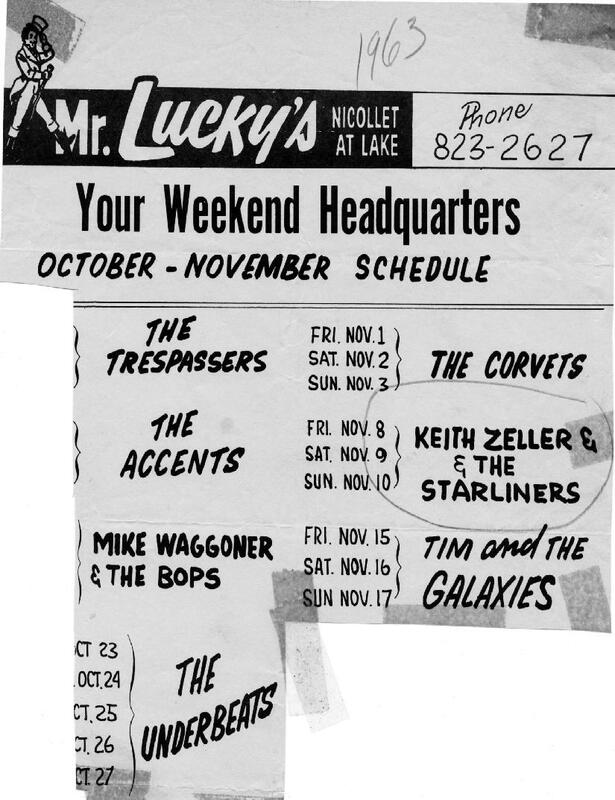 It is at the roller rink where Keith (who has a guitar) hears songs by Elvis, Bill Haley and the Comets, Buddy Holly, Chuck Berry, and Little Richard, among other early rock’n’rollers. Early 1959: Bud Zeller sells Zeller Roller Rink and starts to manage another roller rink in Slayton, Minnesota that is located on Lake Val Halla (just West of Albert Lea). 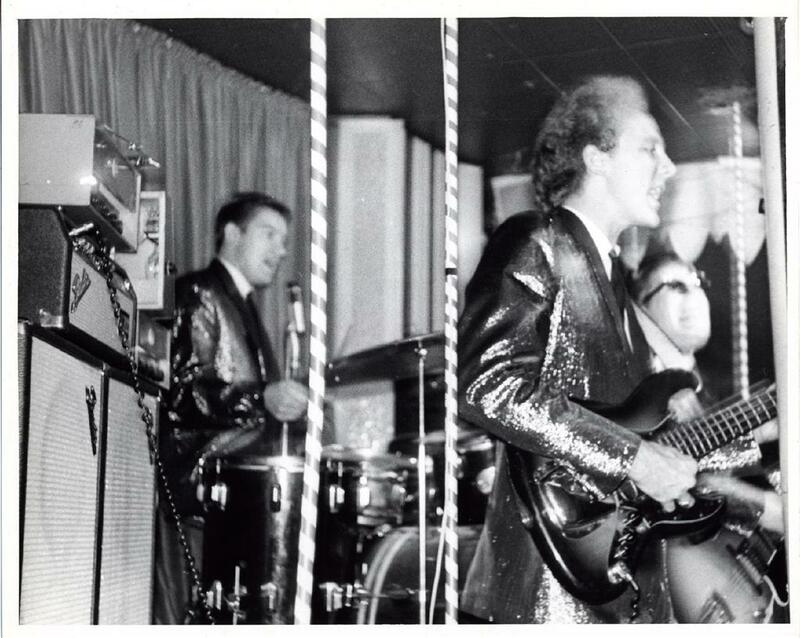 Sonny James comes to town to play a job at the dance hall located next to the roller rink. 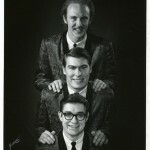 Sonny has a national hit song with “Young Love.” Bud and Keith both attend the concert and Bud invites Sonny to spend the night at their home, which he does. 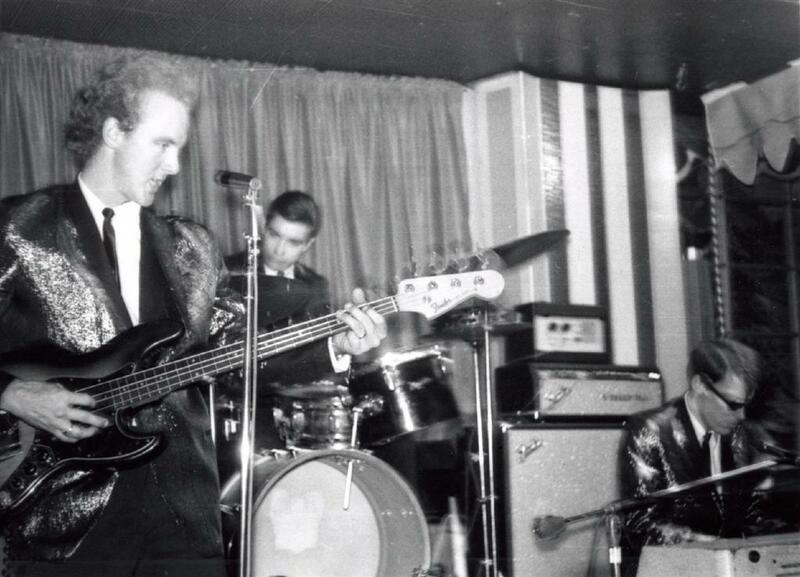 The next day Keith gets his first guitar lesson… from Sonny James. 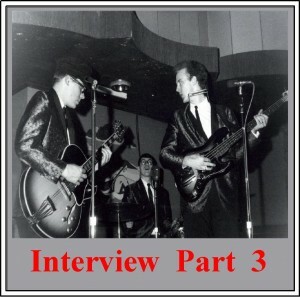 The same day, the road manger for Sonny James stops by the Zeller house and talks to Bud about the possibility of him working as a road manager for rock’n’roll bands and artists for T.B. Skarning. Bud likes the idea and contacts T.B. Skarning in Bloomington who offers Bud a job. Bud accepts the job offer. 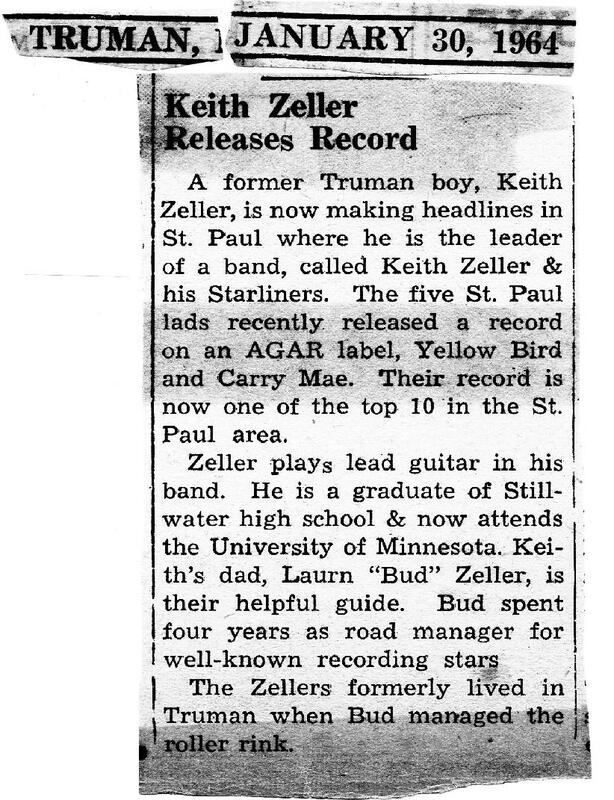 Fall, 1959: The Zeller family leaves Truman and move to Lake Elmo, a Northeastern suburban/rural area of St. Paul. Keith attends Stillwater High School. Bud works as a road manager for booking agent T.B. Skarning out of Bloomington and G.A.C. 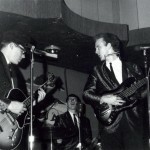 out of Chicago and travels with Bobby Vee, The Fendermen, Johnny Tillotson, Roy Orbison, and Conway Twitty among others. 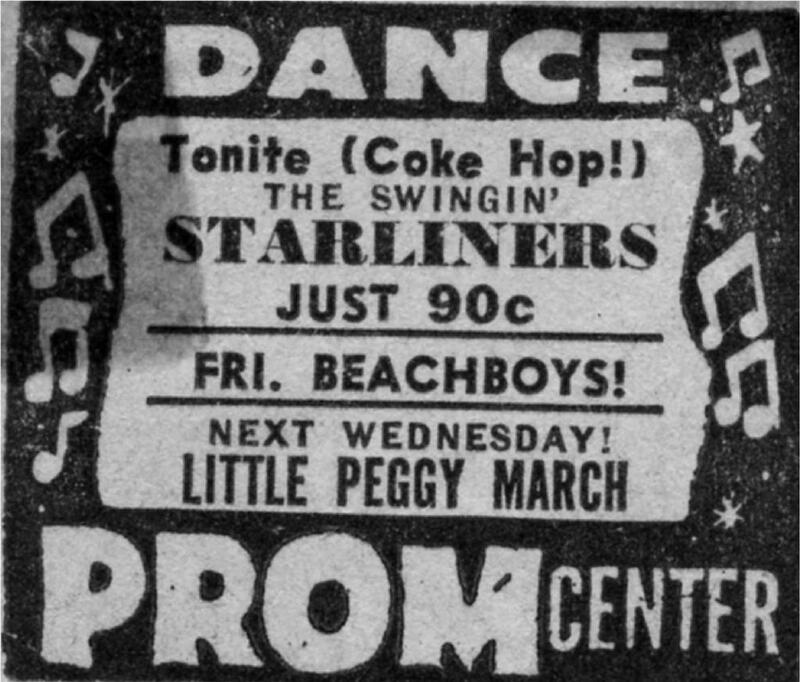 1960: A number of the bands that Bud works with as a road manager play at the Prom Center on University Avenue in St. Paul. Keith starts to check out the bands playing at the Prom Center. 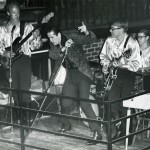 Some of the local/regional bands he sees perform are: Mike Waggoner and the Bops; Johnny and the Galaxies; The Corvets; and Bobby Vee. 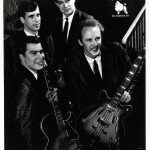 Among the national bands are: Johnny Tillitson; The Fireballs; The Ventures; and Gene Vincent and the Blue Caps. 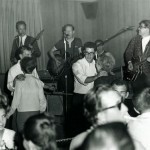 Bud introduces Keith to Bill Strandlof, who also frequents the Prom Center to check out the bands. The two discover they both play guitar and Bill begins taking guitar lessons from Keith at the Zeller home. 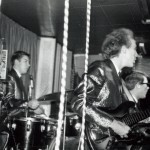 When Keith receives a new Fender Jazz Master guitar as a Christmas present, he sells his Kay guitar to Bill, who eventually buys his own Fender Jazz Master. 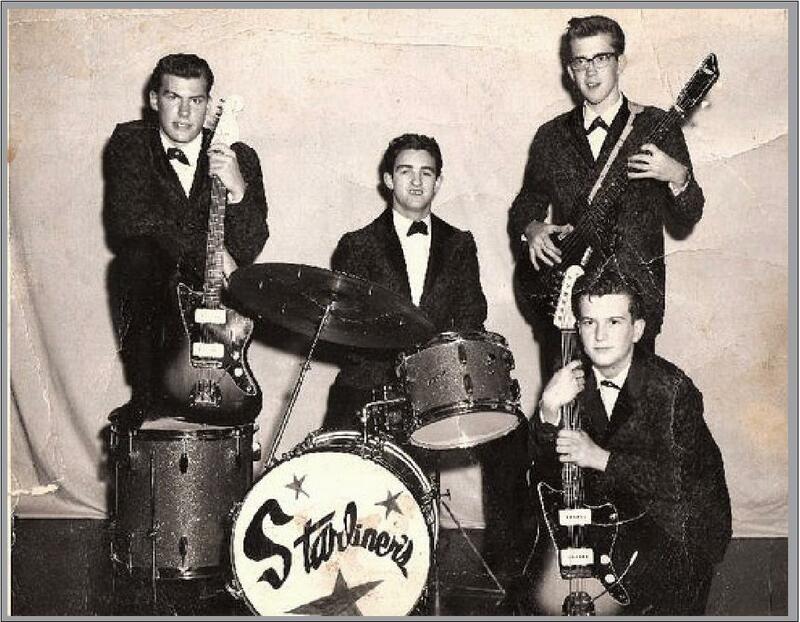 1961: Keith Zeller and Bill Strandlof decide to put a band together called Keith Zeller and the Starliners with the following lineup: Bill Strandlof on rhythm guitar (and eventually) lead vocals; Keith Zeller on lead guitar; Russ Wurst on bass guitar; and Rich Forga on drums and lead vocals. 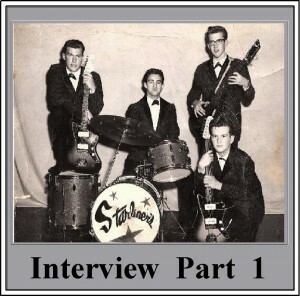 Keith comes up with the band name, borrowing the model name of his dad’s new car… a Ford Starliner. Mrs. Zeller sews the band members matching suit coats to wear on stage. 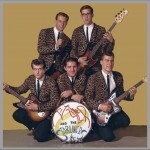 The band plays the Top-40 radio hits that are popular during this time period. 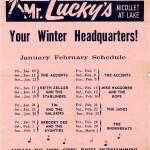 The band plays at various teen clubs in the twin cities including Mr. Lucky’s (Minneapolis), the Yes Club (White Bear Lake), and Club Capasio (St. Paul). The band also plays at the Hazel Park Commercial Club and the Lion’s Club, both in St. Paul. 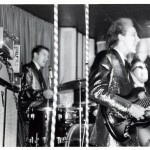 At Hazel Park Commercial Club, the band plays a Battle of the Bands with The Galaxies (who will become Michael’s Mystics). The group also plays at two roller rinks that book local bands, Silver Skate in North St. Paul and Bill’s Roller Rink in Anoka. 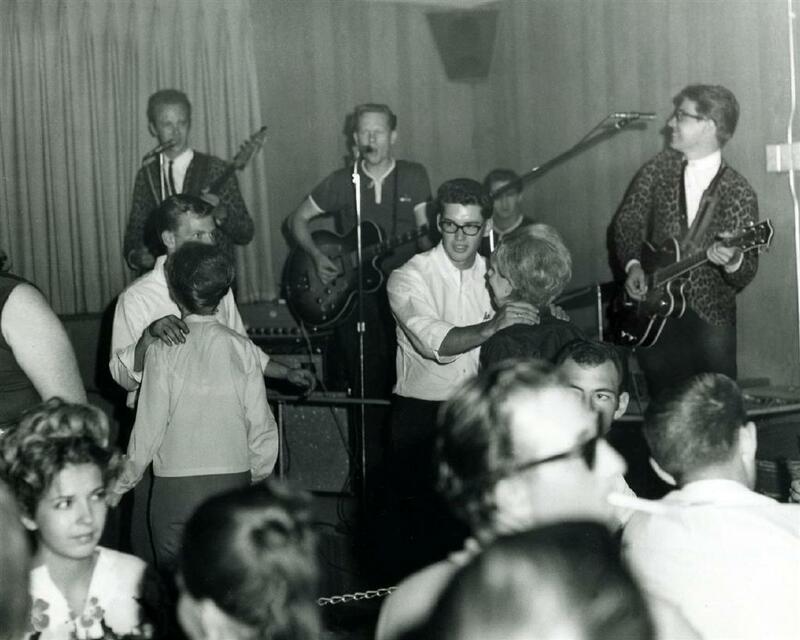 While Keith is out watching The Fortunes (from St. Paul) play live one night at Hazel Park Commercial Club he takes notice of a vocalist that sits in with the band who sings “Tossin’ and Turnin’.” Keith is impressed with the singer, Bobby Lee, and invites him to join his band. Bobby accepts the offer. 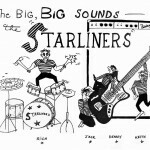 The new version of Keith Zeller and the Starliners is: Bobby Lee on lead vocals; Bill Strandlof on rhythm guitar and lead vocals; Keith Zeller on lead guitar; Russ Wurst on bass guitar; and Rich Forga on drums and lead vocals. 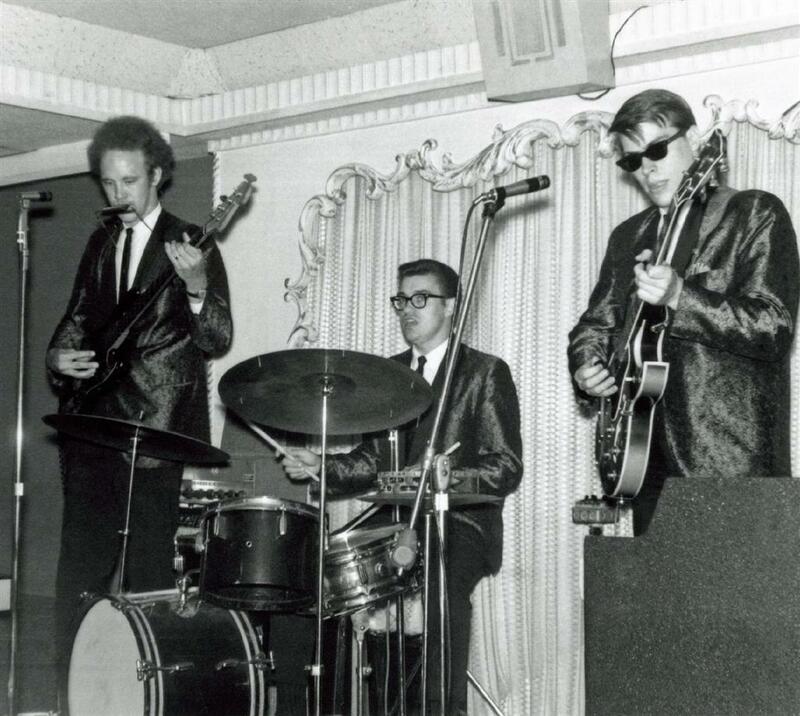 Spring, 1962: The band plays at a private party in downtown Stillwater following the prom dance for Stillwater High School. Summer, 1962: The Zeller family moves from Lake Elmo to Moundsview, a North suburb of Minneapolis. 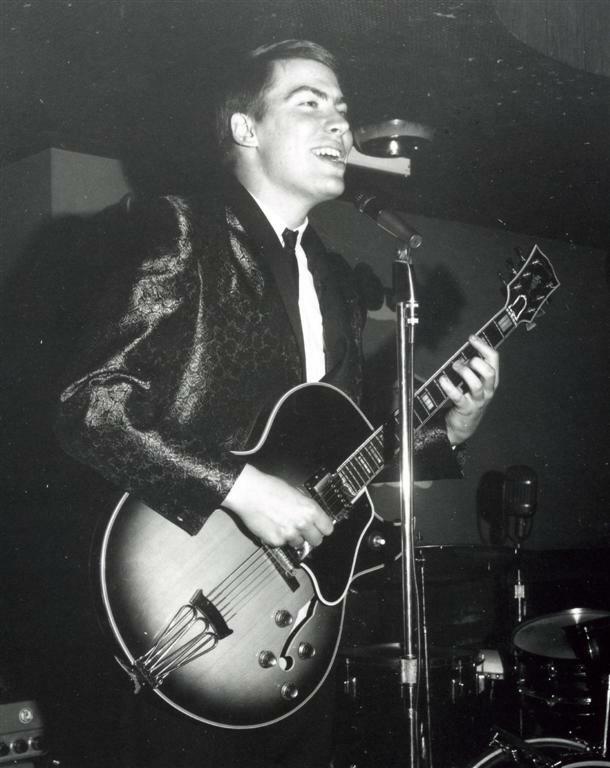 1963: Keith begins to fill in on guitar for Johnny Caola from Johnny and the Galaxies, a local St. Paul band. 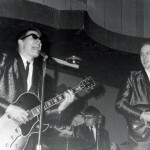 Johnny had injured his fingers in an accident and was unable to play guitar. Eventually, Keith is asked to join the band but declines the offer. The band is booked at The Prom Center in St. Paul. 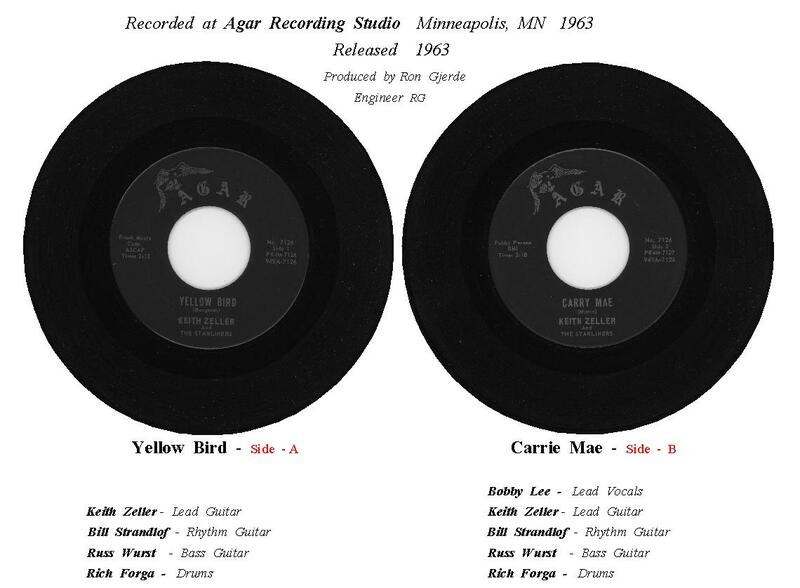 A neighbor of Keith’s in Moundsview, Jack Kollodge, informs Keith about Ron Gjerde, who has a recording studio known as Agar Recording Company in the basement of his home in the “Bryn Mawr” neighborhood of Minneapolis (416 Sheridan Avenue South). 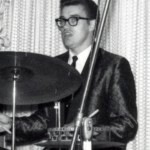 Jack is a partner with Ron at the time and works on recordings at the studio. Bud Zeller takes Keith over to the KDWB studio (in Woodbury, a North suburb of St. Paul) and gives DJ Randy Cook a copy of the 45. 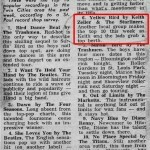 “Yellow Bird” gets airplay on KDWB and makes their Top-40 chart. 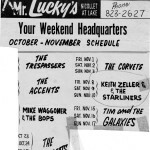 November 8, 9 and 10, 1963: The band plays at Mr. Lucky’s in Minneapolis. 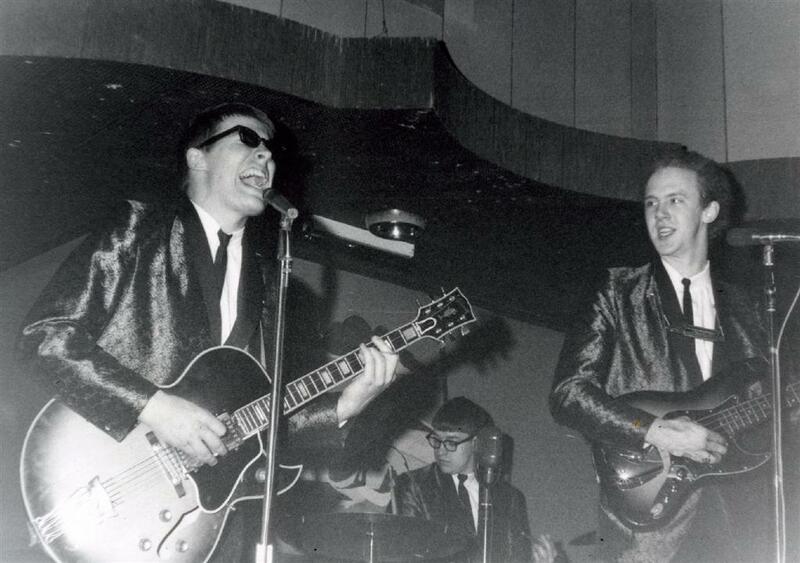 Thanksgiving Day, 1963: Keith plays with Johnny and the Galaxies at a dance hop held at the St. Paul Armory. The Galaxies back up national artists Little Eva and country singer Roy Drusky. Fabian is also on the bill, but is not backed up by the band. 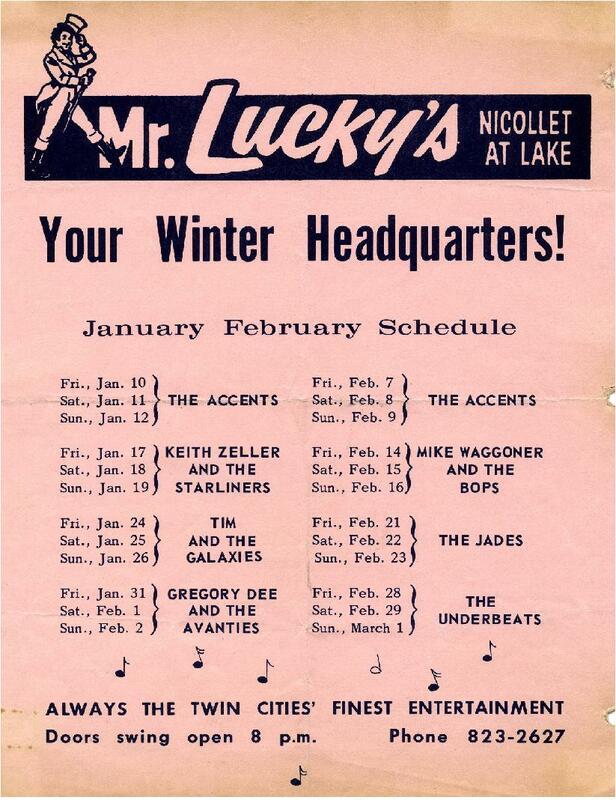 January 24, 1964: The band plays at Mr. Lucky’s in Minneapolis. 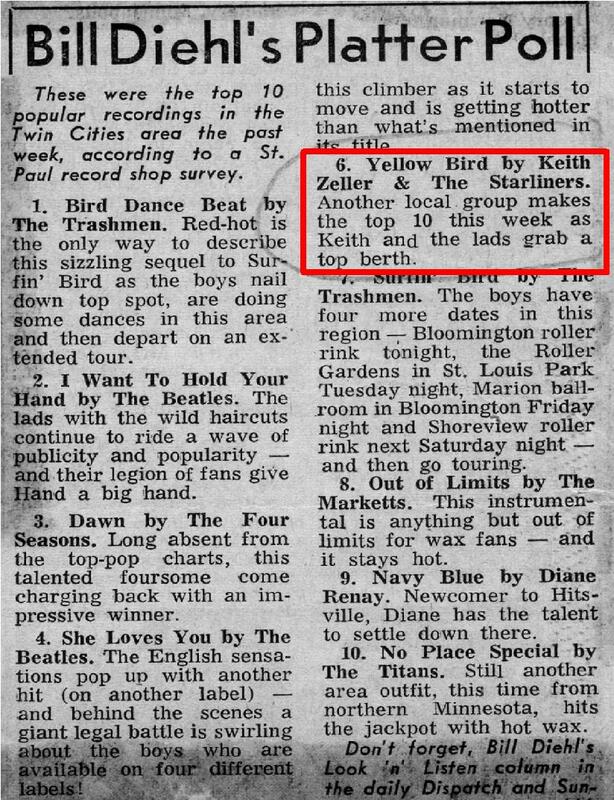 February 15, 1964: “Yellow Bird” by Keith Zeller and the Starliners reaches number 27 on the KDWB Top 40 chart. 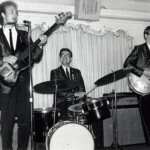 Spring, 1964: About six months after their first recording session, the band returns to studio of Ron Gjerde and record two more songs: “Joy Ride” and “Ubangi Stomp.” Joy Ride” is an instrumental written by Keith. Playing on this song are: Keith Zeller on lead guitar; Bill Strandlof on rhythm guitar; Russ Wurst on bass guitar; and Rich Forga on drums. “Ubangi Stomp” is a Jerry Lee Lewis song. 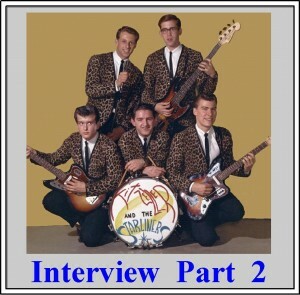 Playing on this song are: Bill Strandlof on rhythm guitar and lead vocals; Keith Zeller on lead guitar; Russ Wurst on bass guitar; and Rich Forga on drums. After the recording session, Ron Gjerde adds talking parts to “Joy Ride” which Keith is not happy with when he hears it. 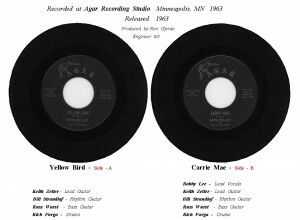 The two songs are cut as an acetate only and never released. 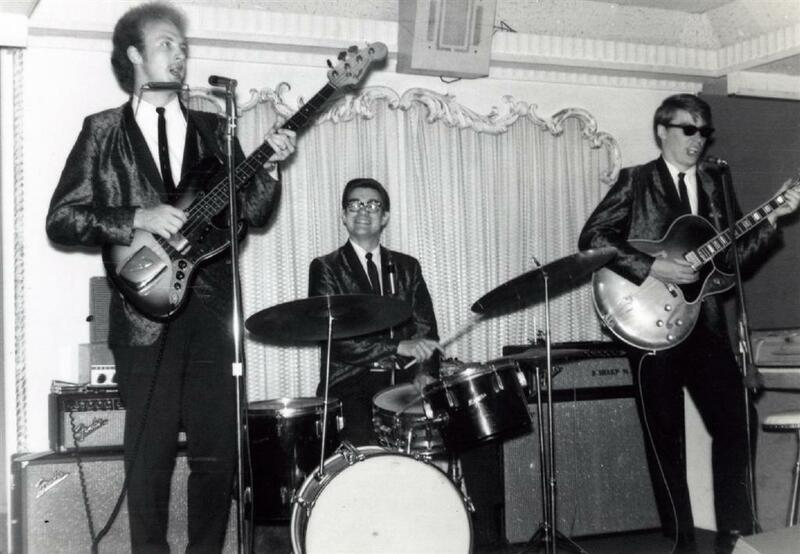 Fall, 1964: Bobby Lee and Russ Wurst leave the band and Keith puts together a new version of the group. 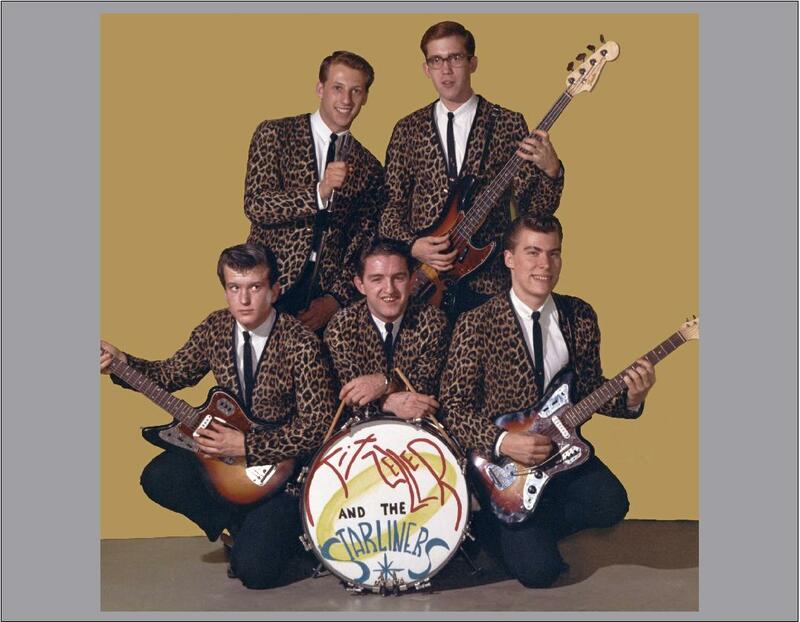 The new version is: Bill Strandlof on rhythm guitar and lead vocals; Keith Zeller on lead guitar; Larry Spendahl on bass guitar; and Rich Forga on drums and lead vocals. 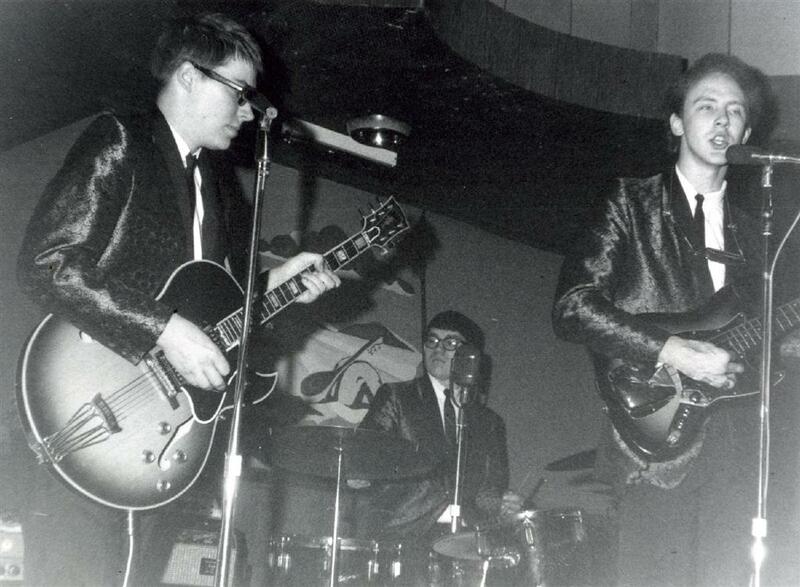 October 10, 1964: The band plays at the Peppermint Club in Chisago, Minnesota. 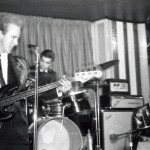 January 20, 1965: Jack Kollodge (bass guitar) and Denny Dale Gudim (guitar) start playing a Wednesday night job with Keith Zeller and Rich Forga at the Village Bar on Front Street in St. Paul as The Starliners. 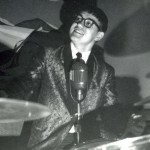 Denny and Jack play with Vinton “Pudgy” Likes on drums on weekends in Wisconsin at the Back Channel Bar. 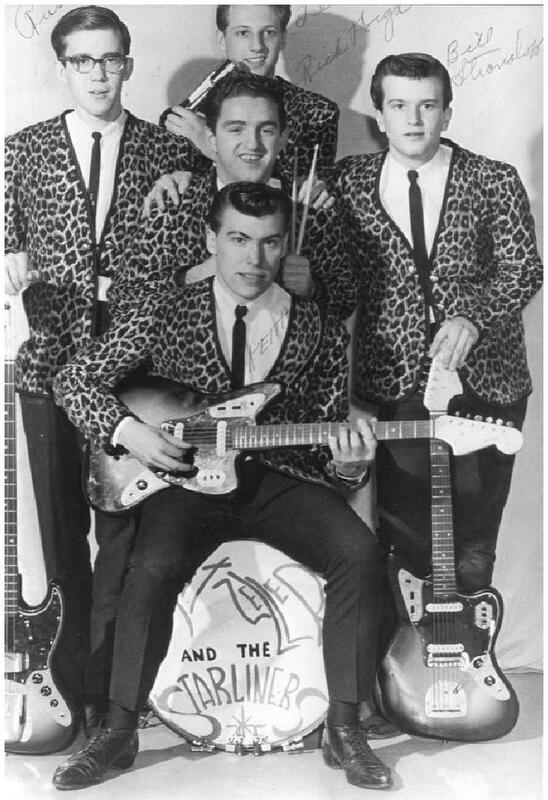 January 28, 1965: The band goes into Agar Recording Studio to record an original song written by Keith called “Roddy the Rocker.” The lead singer is a local Elvis impersonator, Harry Jay. Harry has trouble recording the spoken part in the middle of the song which lasts about 35 seconds and the song is never finished. 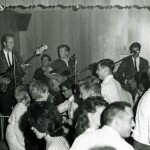 April 7, 1965: Jack and Denny start playing “full time” with Keith and Rich at the Village Bar on Wednesday, Friday and Saturday nights, and the new version of The Starliners is: Keith Zeller on lead guitar and vocals; Denny Gudim on guitar and vocals; Jack Kollodge on bass guitar, harmonica, and vocals; and Rich Forga on drums. Jack hand draws some promo posters of the band that go up on the windows of the Village Bar. 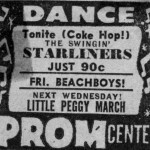 July 21, 1965: A single record with two of Denny’s original songs recorded by Denny, Jack, and Pudgy is released by Denny under the name “Denny & Jack.” It doesn’t get air play and the Starliners sell the records over the bandstand at the Village Bar. 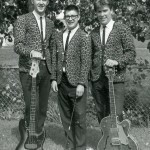 July 21 and 22, 1965: The band travels to Clear Lake, Wisconsin to play two nights. 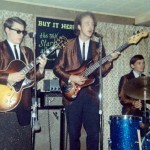 July 23 and 24, 1965: The band plays at Woodley’s Country Dam in Amery, Wisconsin. 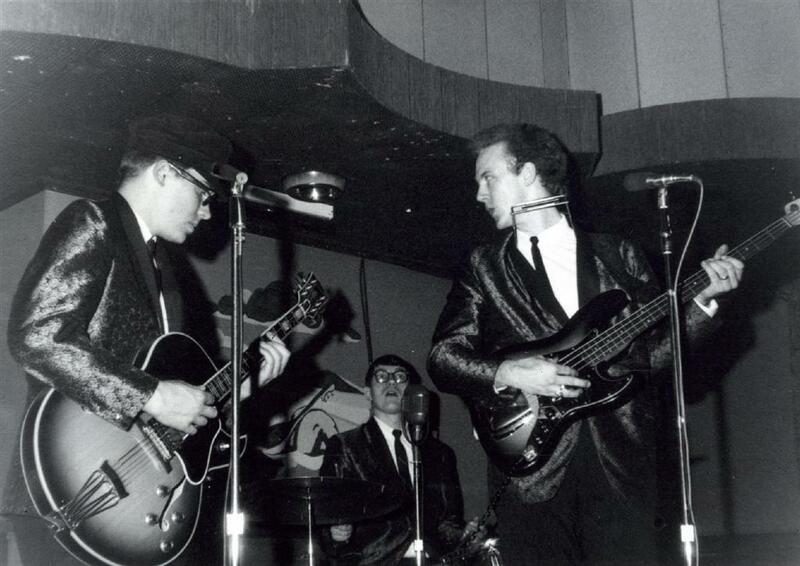 August 22, 1965: The band starts playing Sundays at the Whirlaway Bar in St. Paul. Dave Rodriguez joins the band on second guitar, instead of Denny, for the Sunday night shows. 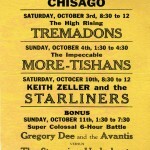 October 13, 15 and 16, 1965: The band plays their final weekend at the Village Bar in St Paul. 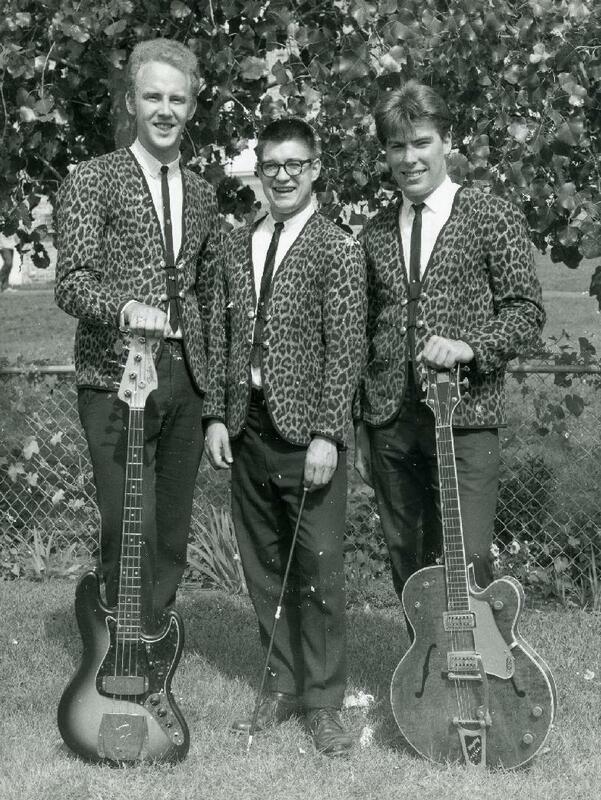 October 1965: The group goes through another transition and becomes a three-piece band. The new version of The Starliners is: Keith Zeller on guitar, piano, and lead vocals; Jack Kollodge on bass guitar, harmonica and lead vocals; and John Rosner on drums and lead vocals. 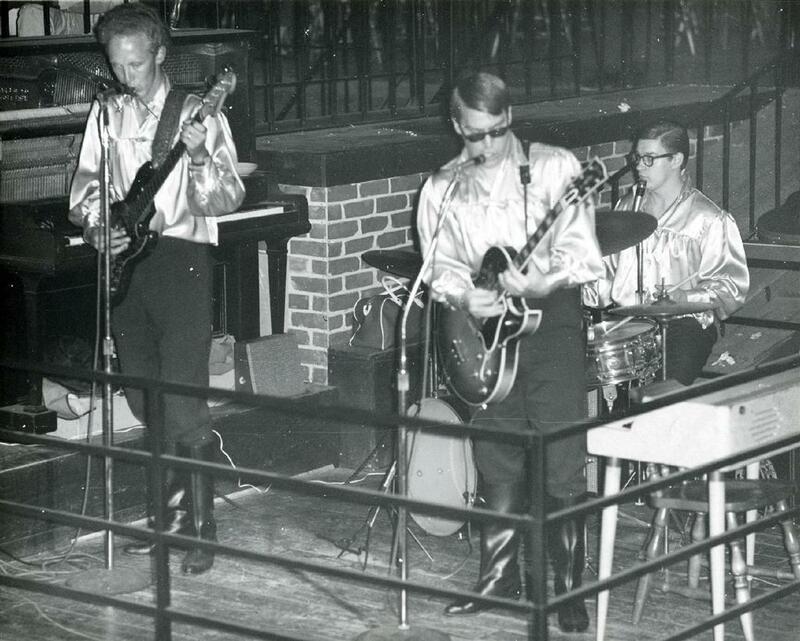 Late, 1965: The band comes to a halt as Keith enters basic training for the Minnesota Air National Guard (six weeks in San Antonio, Texas and six weeks in St. Louis, Missouri). 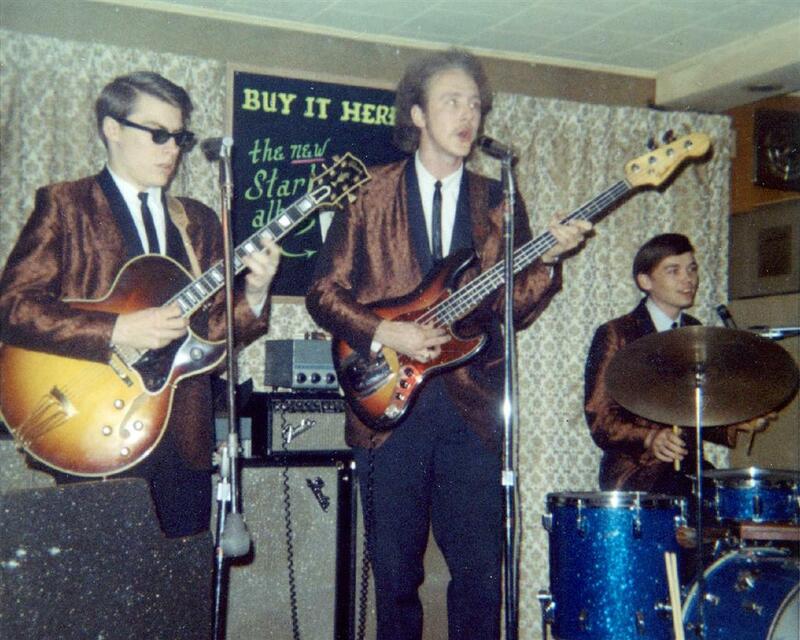 December 29, 1965: Jack Kollodge and John Rosner audition with Denny Gudim to play at the Bull Pen Bar in Hopkins. 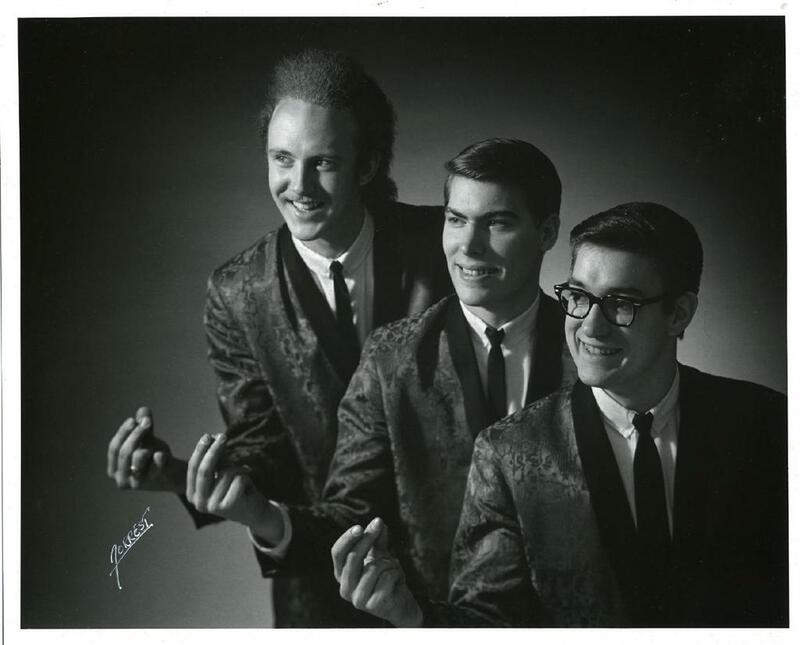 January 3, 1966: Jack, John and Denny start playing six nights a week at the Bull Pen Bar in Hopkins as Denny Dale and the Runarounds. 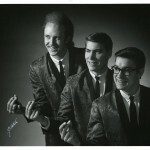 Denny had previously released “Mr. 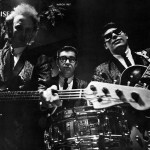 Moon” on Soma records and on February 12, 1966 Billboard Magazine picked it to hit the Hot 100 however ther record did not chart. 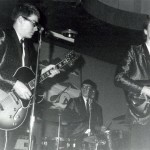 April, 1966: Keith returns after completing basic training and the band restarts, again with Keith Zeller on lead guitar and vocals; Jack Kollodge on bass guitar and vocals; and John Rosner on drums. After Jack and John leave Denny Gudim, Denny finds two new sidemen to play in his trio. 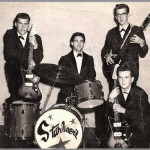 At this point the band changes names to The Starliners. 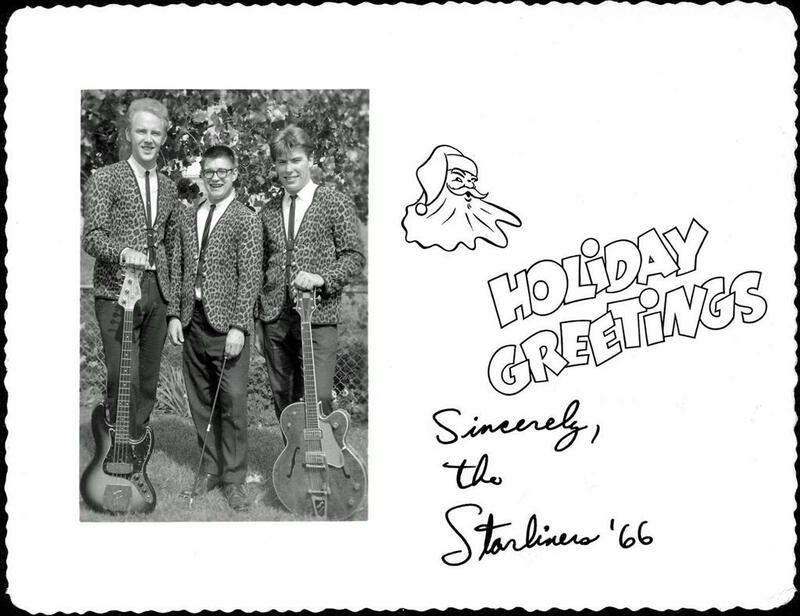 April 4, 1966: The new three-piece version of the Starliners is back in action playing at The Rathskeller in Mankato for six nights. 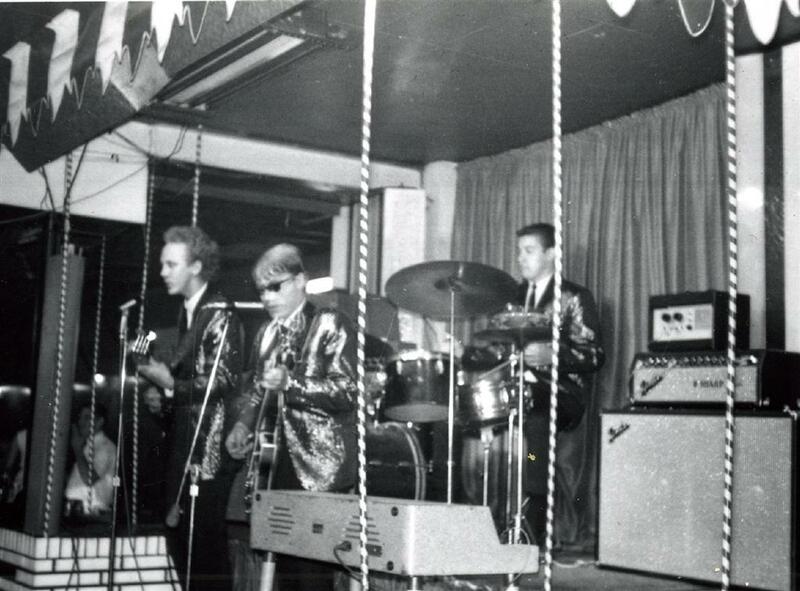 July 11, 1966: The band plays their first job at Papa Joe’s Northern a Go-Go in North Minneapolis (323 West Broadway). 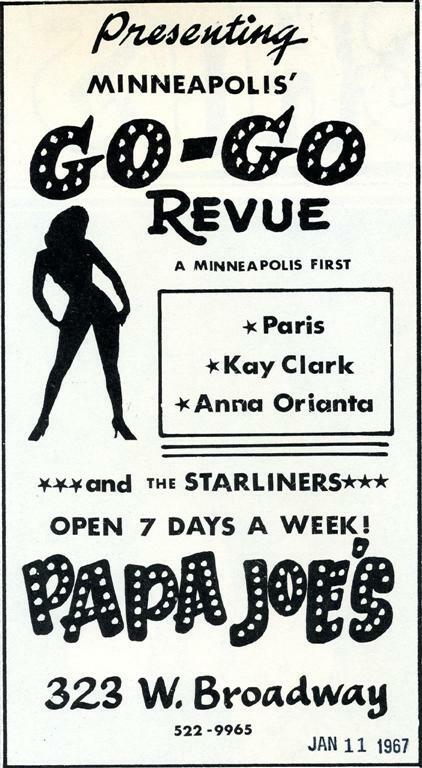 The club features Go-Go Girls (billed as “Go-Go Dolls”) dancing on stage next to the band. The job is for seven nights. 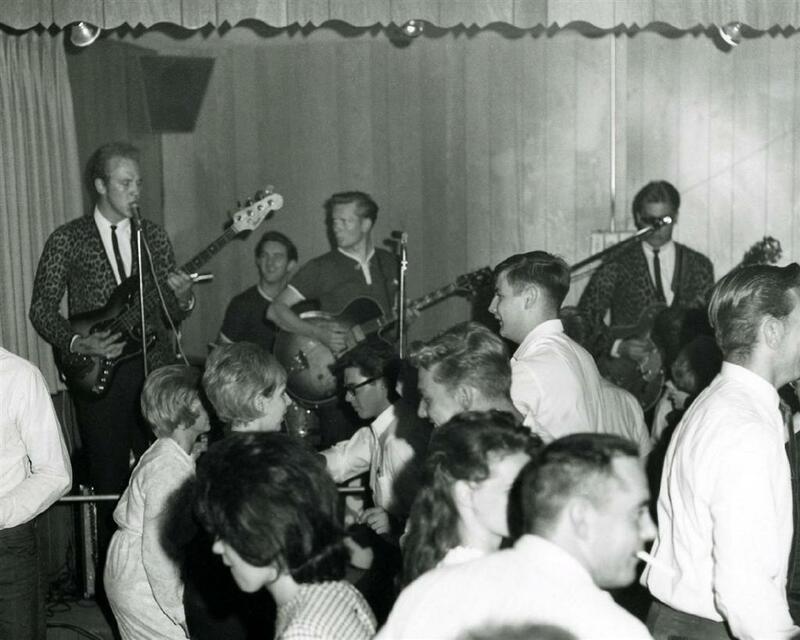 August 5, 1965: The band returns to Papa Joe’s in Minneapolis for what will be a 22 week run at the club that will keep the band booked through the end of the year. 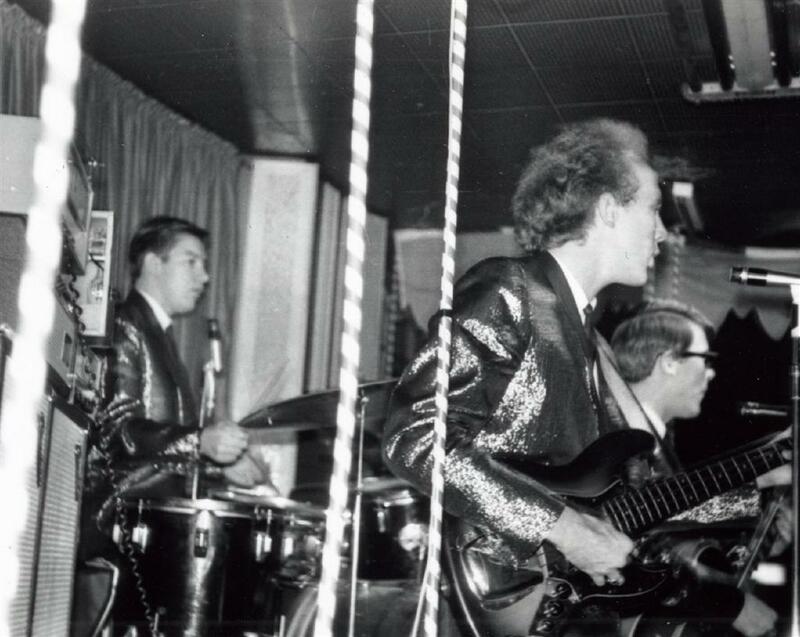 November, 1966: Jack comes up with an idea to record the band live at Papa Joe’s and talks to Ron Gjerde about production costs and pressing up an album of the band playing live. Jack also talks to Papa Joe Daszkiewicz, the club owner and gets the okay to do the recording. Papa Joe likes the idea and offers to loan Jack one half of the production costs. Jack purchases a new Sony tape recorder and has half track heads installed. For the recording, Jack uses a tap off of the PA mixer for one channel and uses a remote Altec studio microphone for the second channel. The two tracks are mixed at Agar Recording Studio. Jack records the band playing live during a week at Papa Joe’s. Over thirty songs are recorded and then ten are selected to be on the album. Among the ten songs are “Broken Engagement” written by Keith Zeller. Jack plans to press up 500 albums and sell them at three dollars a copy which would pay back his production costs. Rather than using the local Kay Bank plant for the pressings, Jack decides to have the pressings done at RCA’s custom record plant in Chicago thinking he might get a better product. 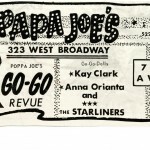 January 2, 1967: The band continues at Papa Joe’s. 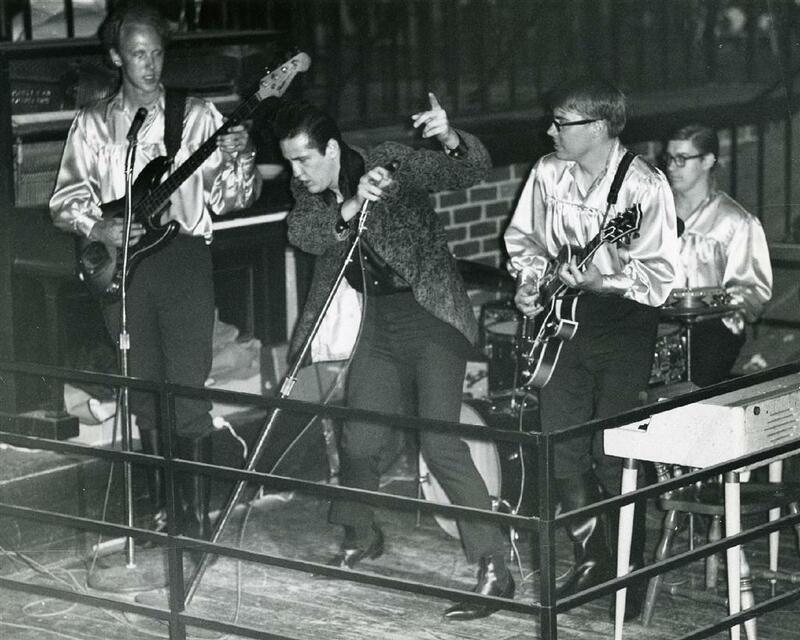 For the song “Little Red Riding Hood” (Sam the Sham and The Pharoahs), the band comes up with a stage show. As Keith sings the song, Jack (wearing plastic “vampire teeth”) takes on the role of the wolf in the song and chases one of the Go Go dancers around the stage. 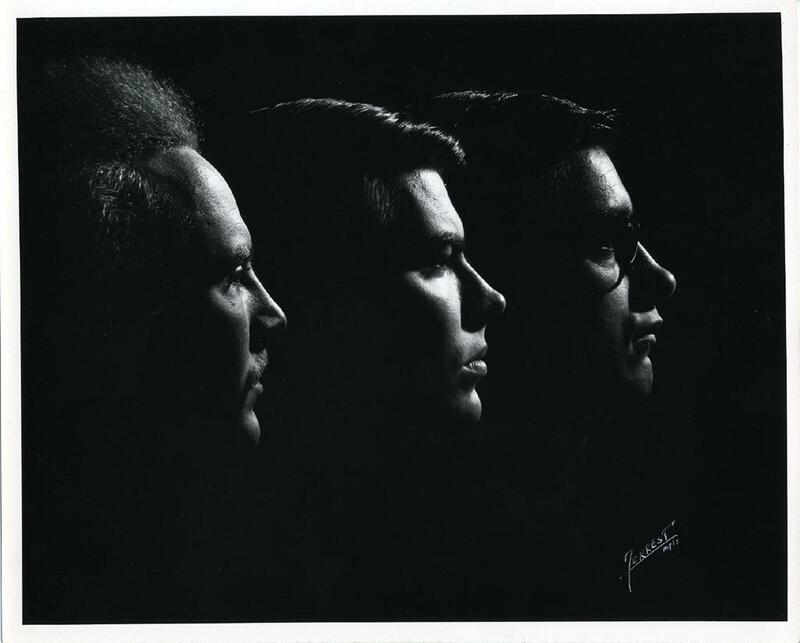 February 8, 1967: The band has promo photos taken by a Twin Cities photographer, Alan Forrest. 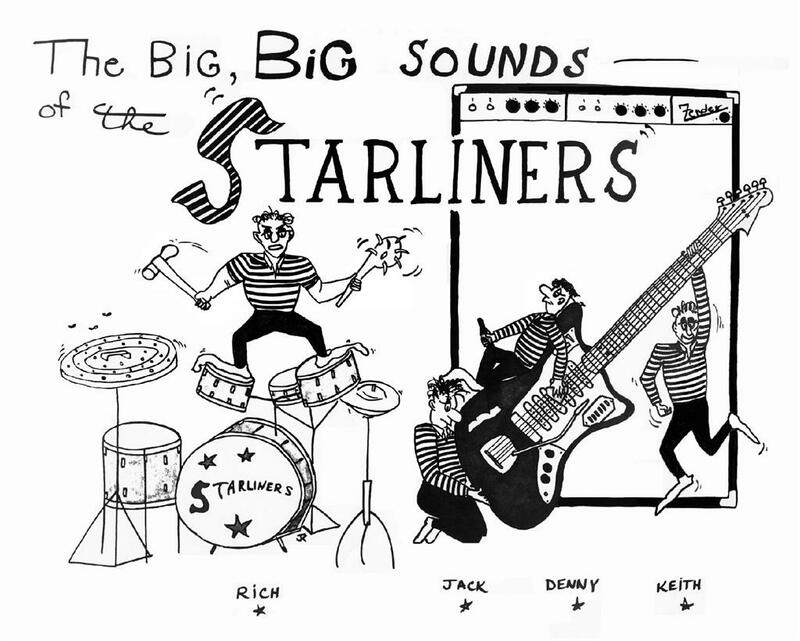 Alan Forrest had just received a contract to do several covers for the national publication, Musical Merchandise Review and decides to use a wide angle picture he had shot of the Starliners for his first cover, a fold-out. 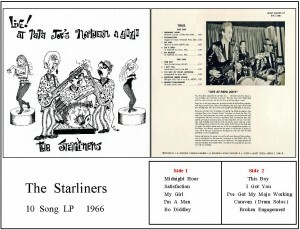 The Starliners take up the entire front cover for the March, 1967 issue, however, nowhere in the magazine is the name of the band mentioned and nowhere is the name of the photographer mentioned. 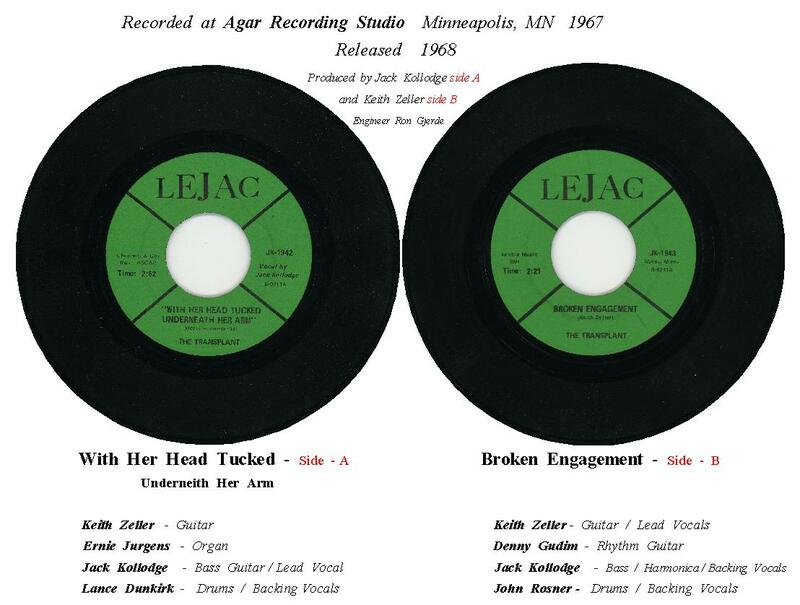 March 6, 1967: LeJac Records receives a shipment of 124 of the albums, called “Live at Papa Joe’s Northern a Go-Go.” The album is already two and a half months late and Ron Gjerde and Jack have to contact the pressing plant many times to see what is going on with the pressing. RCA assures them over and over again that all of the 500 albums will be shipped out in a timely manner. However, in one phone call, RCA admits they have misplaced half of the album jackets. After two more shipments from RCA, Jack receives a total of 278 albums. The balance of the order is never fulfilled by RCA. This causes problems as Jack’s production costs come to $1,018.86 which includes the loan already paid back to Papa Joe at 20 percent interest. March 20, 1967: Keith and Jack pay a visit to KUXL radio and meet with ‘Admiral Richard E.’ who is a DJ at the station and plays the new album over the air. 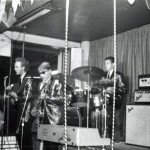 Spring, 1967: While playing at Papa Joe’s the band is asked to play a Friday morning job at The Mermaid in Mounds View. The club owners want to attract workers from the overnight shift at The Arsenal which ends at 7:00 AM on Fridays, which was payday. The band takes on the job and are surprised to discover there actually is an audience for live rock music at 8:00 AM in the morning. The job results in a lack of sleep for the band and ends after a week or two. 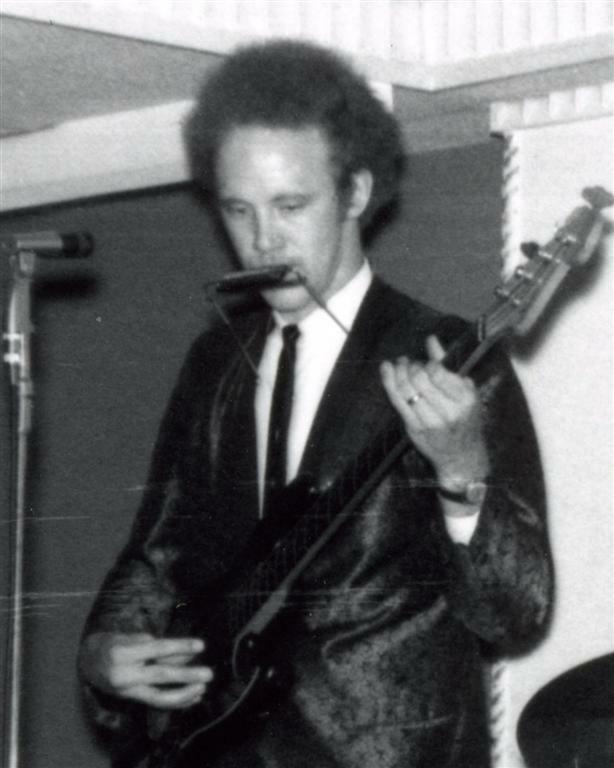 July 29, 1967: After playing a two week job at The Flame Nite Club in International Falls, Minnesota, Jack leaves the band to play with Denny Gudim and then Bobby and the Shy Guys. John Fritz, from St. Cloud, joins the Starliners on keyboards, trumpet and vocals. 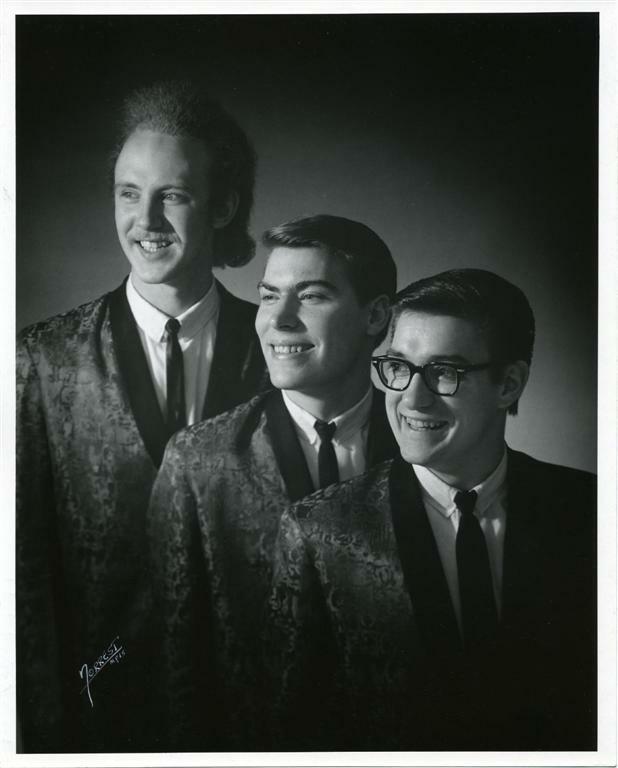 September 9, 1967: Jack records “With Her Head Tucked Underneath Her Arm” at Agar, with Lance Dunkirk (drums) and Ernie Jurgens (organ), both from Bobby & the Shy Guys, and asks Keith Zeller to play lead guitar. 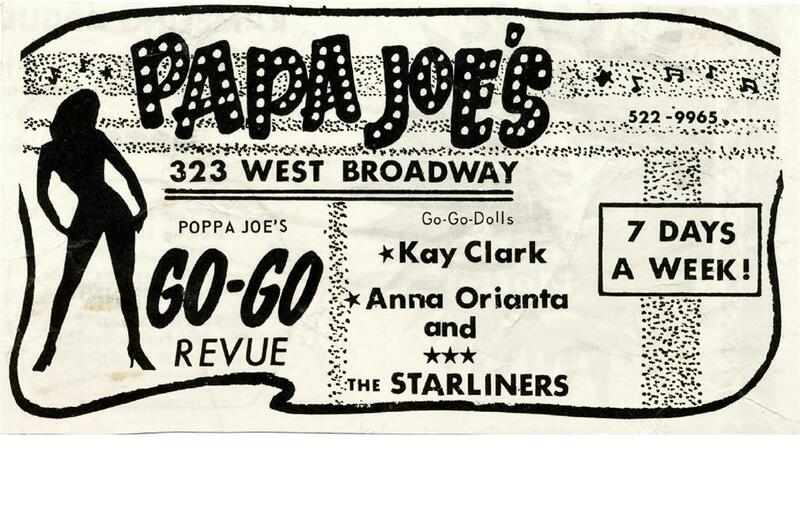 November, 1967: Jack returns to the Starliners who are still playing at Papa Joe’s. This new lineup is: Keith Zeller on lead guitar and vocals; John Fritz on keyboards, trumpet and vocals; Jack Kollodge on bass guitar, harmonica, and vocals; and John Rosner on drums and vocals. 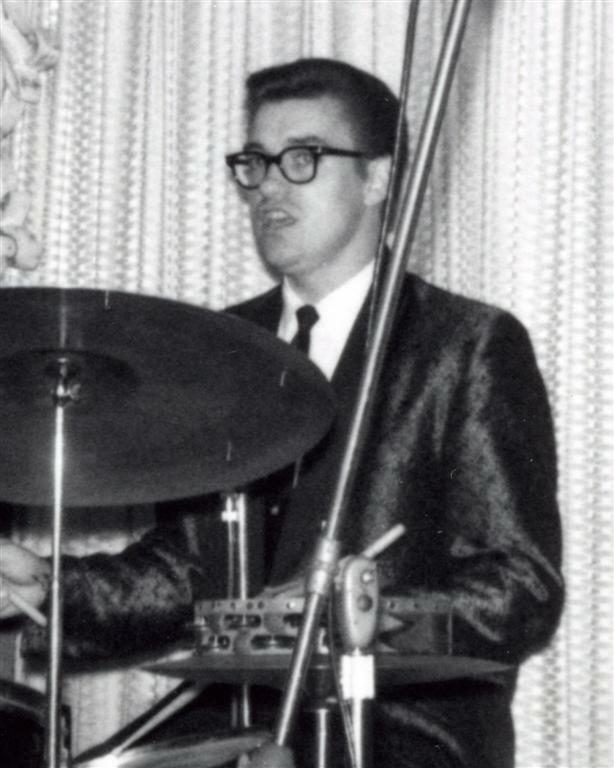 The band members would switch instruments from time to time. 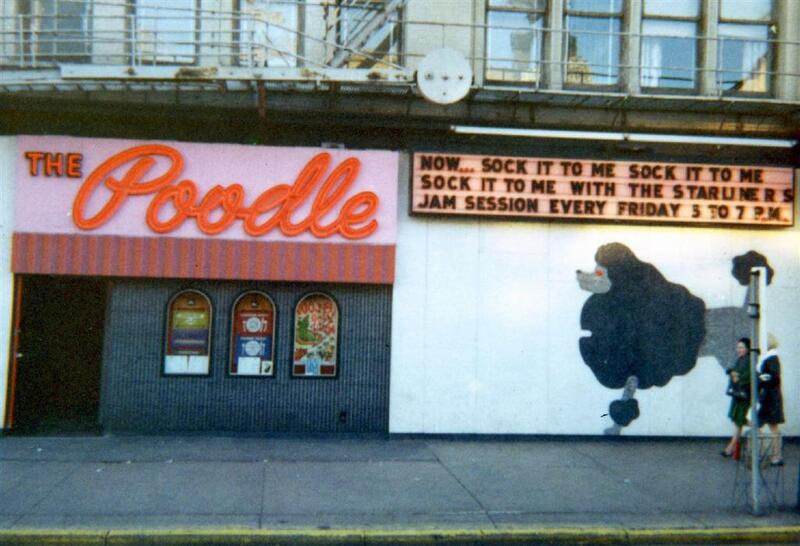 January 1, 1968: The band starts a new job at The Poodle in downtown Minneapolis (810 Hennepin Avenue). The band plays every night of the week with the exception of Sunday including a Friday afternoon jam session. On Sundays the band plays at other venues. 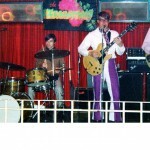 The band will play the club through all of 1968 and into the summer of 1969. 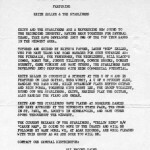 September, 1968: The band decides they want to release a 45. 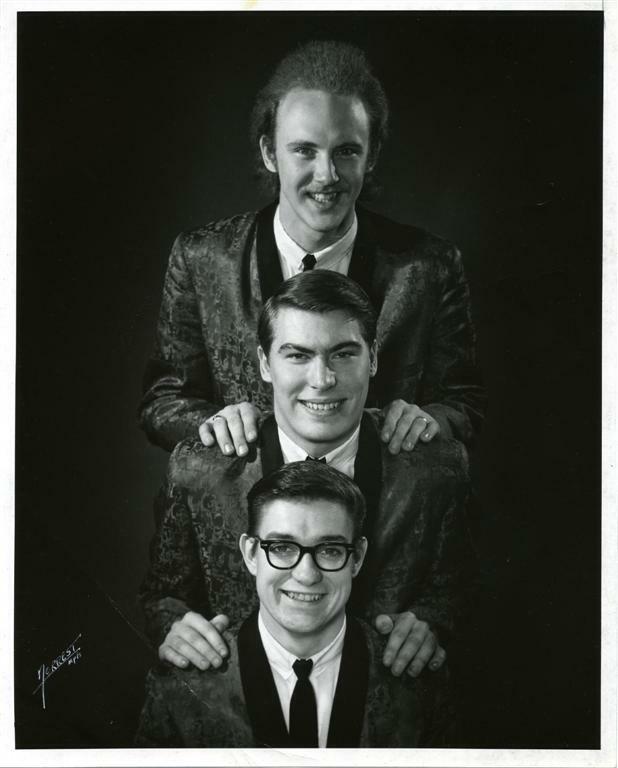 Two songs already recorded with Keith and Jack are chosen for the 45: “With Her Head Tucked Underneath Her Arm” (KingstonTrio) and “Broken Engagement” (Keith Zeller). A minor change is made in the vocals on the A-side with Jack re-recording the vocal track. “Broken Engagement” had been recorded on May 26, 1967 with a slightly different beat than the album version and using a 12 string guitar. 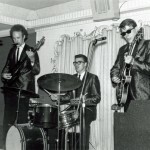 On the A-side are: Jack Kollodge on bass guitar and lead vocals; Keith Zeller on guitar; Ernie Jurgens on organ; and Lance Dunkirk on drums. 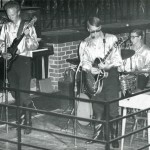 On the B-side are: Keith Zeller on guitar and lead vocals; Denny Gudim on 12 string guitar; Jack Kollodge on bass guitar, harmonica and vocals; and John Rosner on drums and vocals. 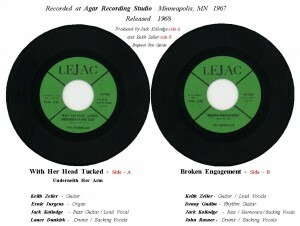 Jack and Keith split the cost for the pressing and 500 copies of the 45 are released on the LeJac label. 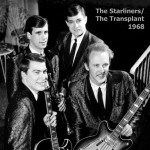 At this point in time the band is looking for a new image and the Starliners become The Transplant. The group drops the matching suit coats, black turtlenecks or white shirts and ties and begin to wear clothes from the psychedelic era including flowered shirts, bell bottom pants, colorful scarves, and later on… Nehru shirts. 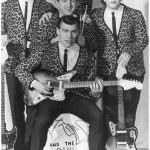 The 45 did not receive any airplay and the band sells the record at their shows. 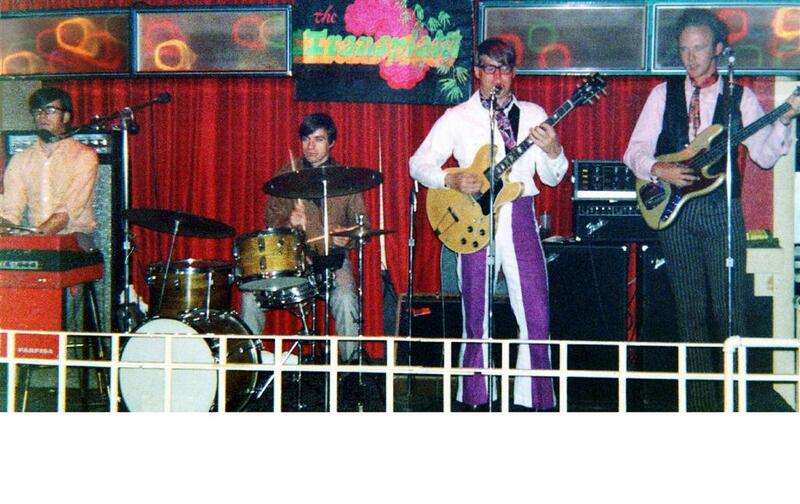 January, 1969: The band continues their run at The Poodle into the last year of the 1960’s. 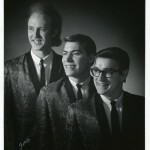 June, 1969: John Rosner decides to leave the band. 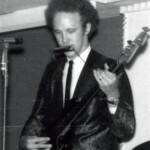 June, 1969: Jack Kollodge leaves the band. 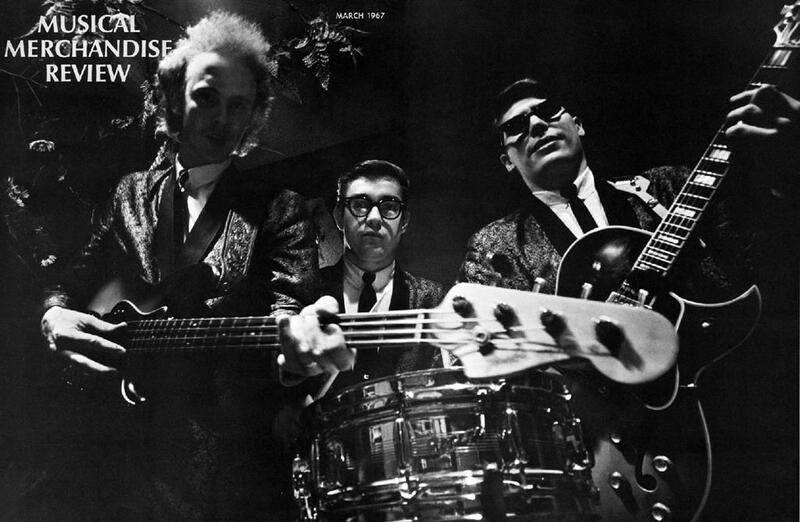 After playing Rock’n’Roll music for most of the decade of the 1960’s (under three names) the band comes to an end. 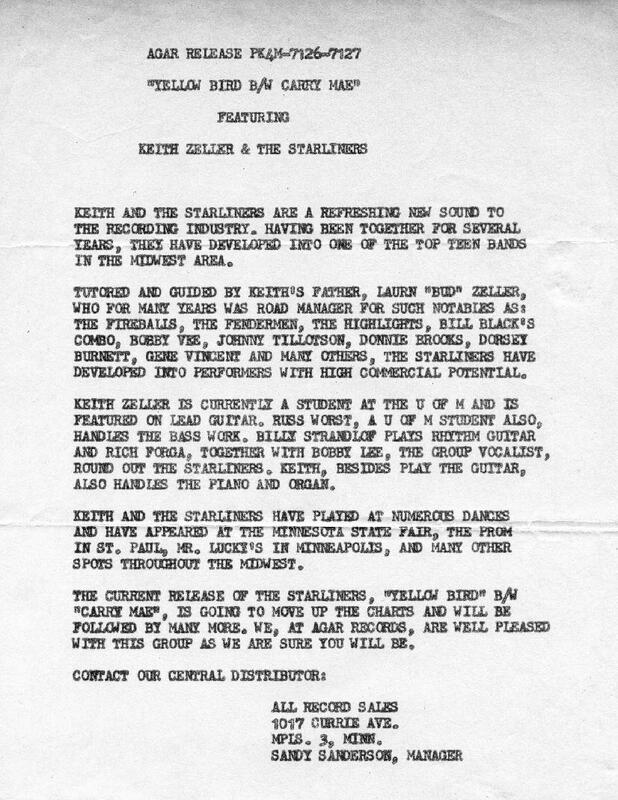 In December, 1984, The Starliners (Keith, John, and Jack) had a reunion concert in Honolulu, Hawaii at the Bronco Bar. Keith and John were both living in Hawaii at the time and Jack was on vacation there. 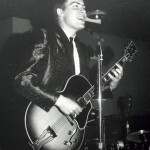 In 2008, Keith Zeller was awarded a Lifetime Achievement Award by Rock Country Hall at a concert/ceremony held at the Medina Entertainment Center. In 2013, Keith Zeller reported that only one acetate of the bands second recording at Agar (“Joy Ride” and “Ubangi Stomp”) is known to exist. 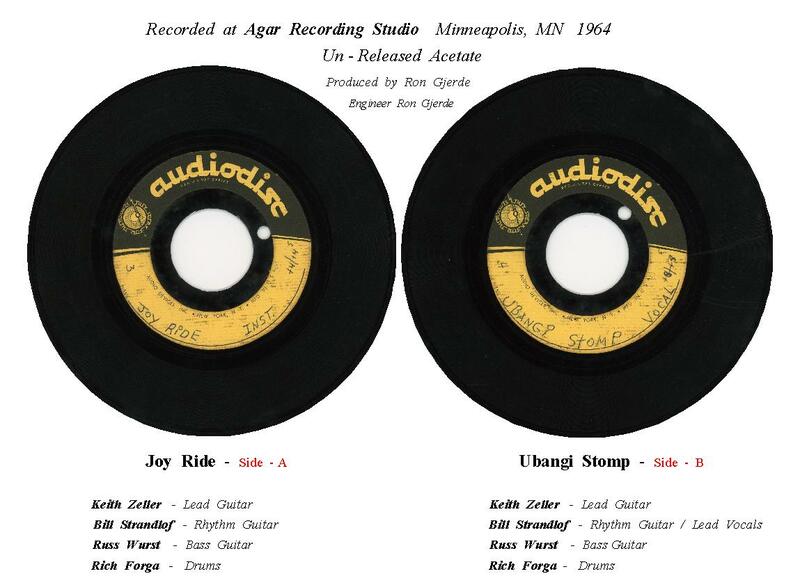 On the acetate, “Joy Ride” does not have the talking parts that were added to the song by Ron Gjerde after the initial recording. 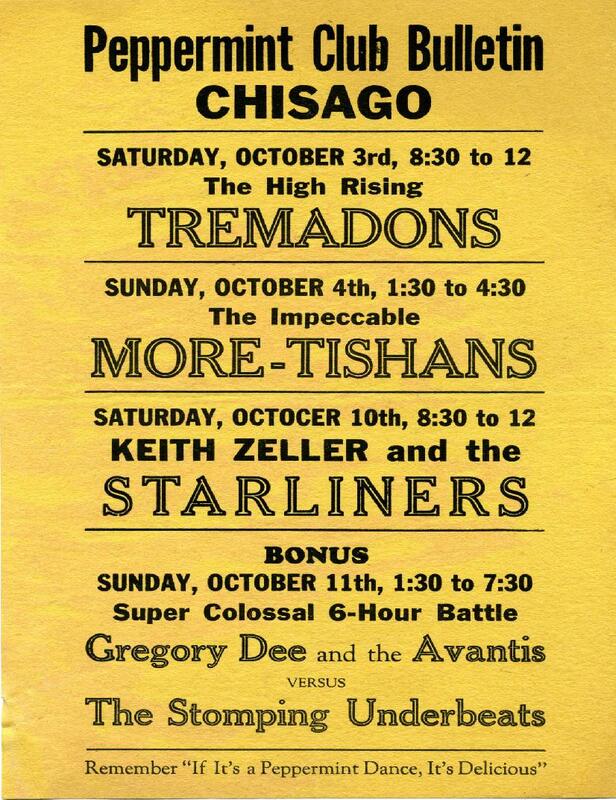 Keith also recalled playing at a Battle of the Bands at Aldrich Arena in St. Paul with The Underbeats, The More-Tishans, and The Sting Rays. 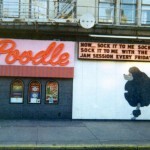 In 2013, Jack Kollodge reported that a relative of his did the cover art for the live album, a humorous drawing of the band on stage at Papa Joe’s with a Go Go dancer on each side of the band. 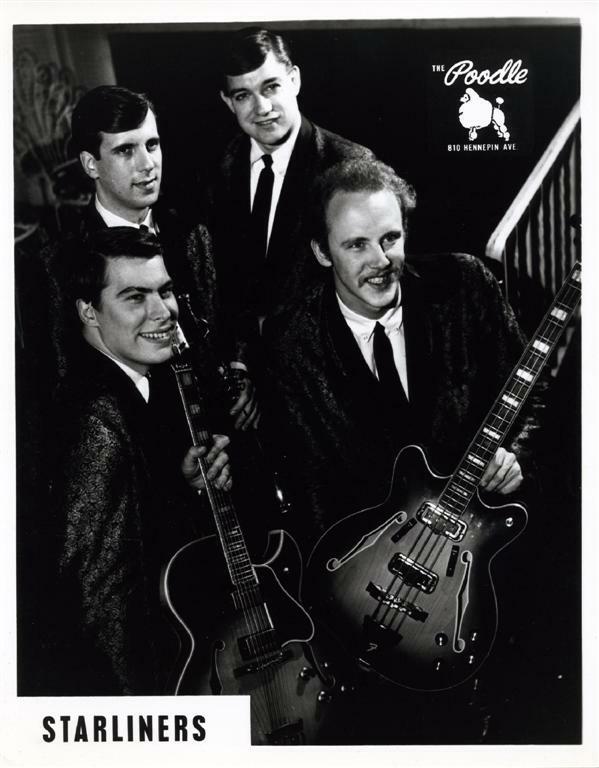 On September 1, 2013 Keith Zeller was inducted into the Iowa Rock’n’Roll Hall of Fame as a member of The Memory Brothers. 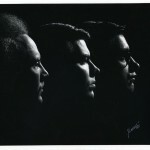 The band’s live album recorded at Papa Joe’s in Minneapolis has become a highly sought after album by record collectors. 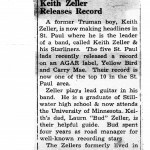 Keith Zeller: Living in Winona, playing in The Sisters and Company and The Memory Brothers. 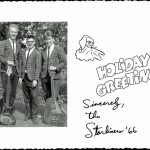 Bill Strandlof: Passed away at age 49 on March 4, 1995. Bill was living in Roseville. Russ Wurst: Living in Cleveland, Ohio. Rich Forga: Living in Colorado. 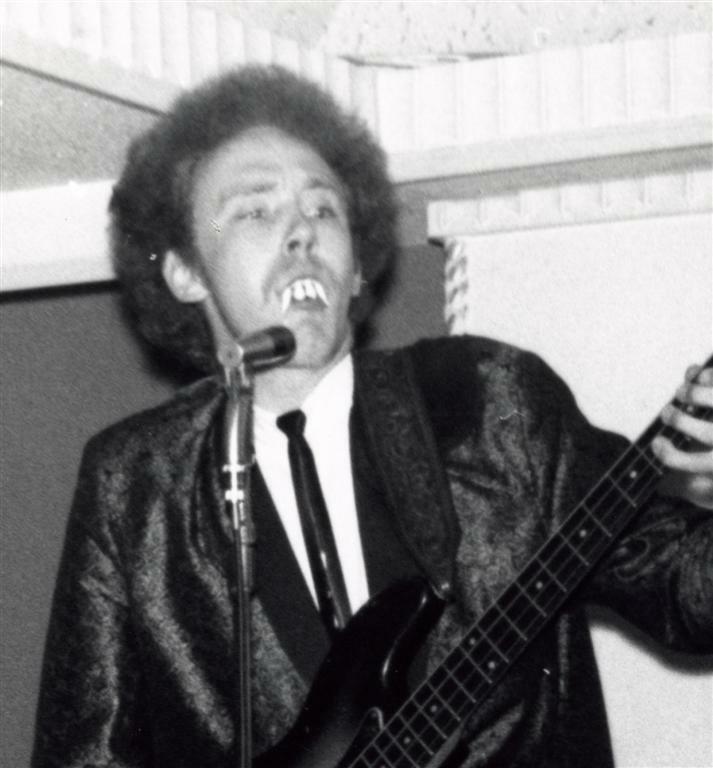 Bobby Lee: Passed away on July 30, 2013. Jack Kollodge: Living in Moundsview. John Rosner: Living in Las Vegas. 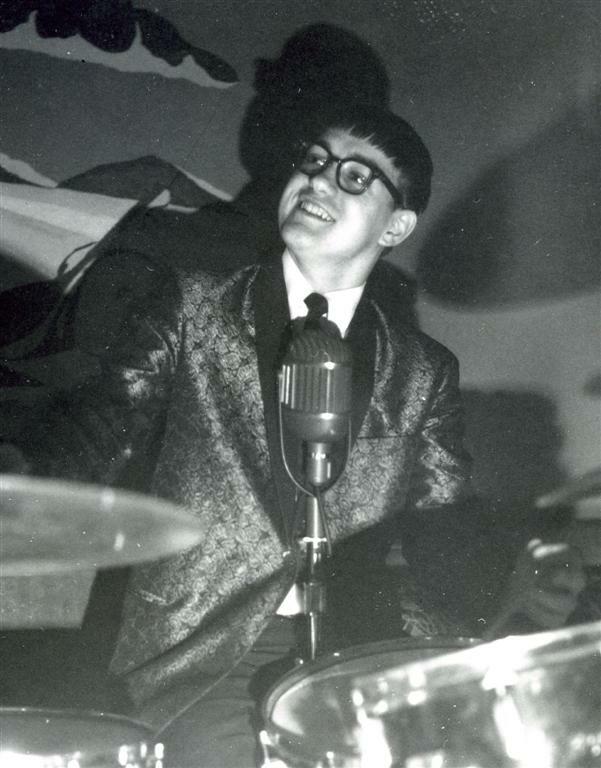 Denny Gudim: Passed away at age 63 on November 23, 2004.